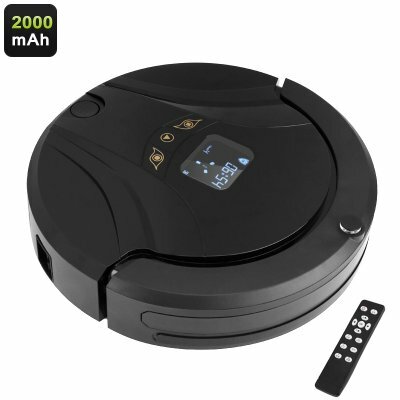 Successfully Added Aosder Robotic Vacuum Cleaner - 800Pa Suction, Automatic Recharge, 2000mAh, 4 Cleaning Modes, Remote Control to your Shopping Cart. Never again waste a single minute of your free time on doing household chores thanks to this smart robotic vacuum cleaner. With the Aosder robot vacuum, you’ll be able to clean your home in a fun and efficient manner - guaranteeing that your floors always look spick and span. Featuring 800PA of suction, this high-end vacuum cleaner is capable of removing dust, dirt, and small objects from your floor in absolutely no time. Thanks to its smart navigation modes, this robotic vacuum is guaranteed to cover every inch of your apartment without leaving a trail. Packing an epic 2000mAh battery, it is capable of working for up to 90 hours in a row. Its smart features additionally allow it to recharge on its own, meaning that when the power gets low it will return to the charging station on its own. Like this, you can be assured that your robot cleaner always has enough juice to clean your entire household or office no matter the size. Supporting 4 different cleaning modes, the Aosder vacuum cleaner is capable of cleaning your floor in spiral mode, 'Z' mode, wrapping mode, and random mode. Additionally, this robotic vacuum allows you to set pre-selected cleaning times during any day – ensuring that you’ll always arrive home in a clean apartment without you needing to lift a finger. Coming with its own remote control, you will always be able to control your robot cleaner and navigate it effortlessly to those places that need cleaning most without ever leaving your sofa. Thanks to its compact and slim design, this smart vacuum cleaner is capable of cleaning underneath your closets, coffee table, and other furniture. Its intelligent navigation feature allows the vacuum to move around effortlessly throughout your home without crashing into any object. It furthermore comes with its own isolator box that lets you close off areas so that your robot cleaner will never get stuck in cables or moves to an area where you do not want it to clean. In this way, you can let it clean your home without disturbing your kids making homework in their bedroom or it getting in your way in general terms.